Summer Floral Wallpaper Vectors are here. 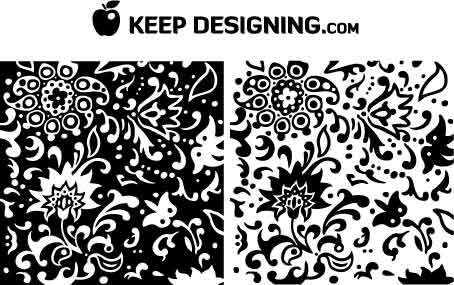 Today�s free vector is a stylish wallpaper vector, both a black and white version. These wallpaper vectors can compliment any print design or web design you might be working on. These free illustrated wallpaper vectors are original, copyright free artworks that can be used on any commercial or personal project. This eps file is friendly to anyone using adobe illustrator 8 or higher- Enjoy. Thanks for checking us out, come back soon for more free vector art and graphic design resources. I could use stuff like this for my digital scrapbooking also. Thank you for sharing! My new bathroom wall loves you for this great pattern!! it looks great, ii have the design in my bedroom. can i use this for my book? Hi Zel, yes- you are free to use this pattern for your book, enjoy. 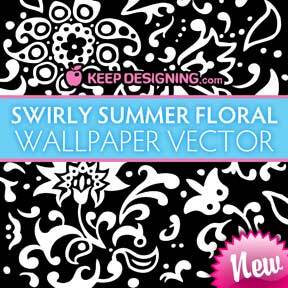 I love the swirly summer floral pattern – does the link still work – it won’t download for some reason. It’s working for me wendy! Very cool. Do you have a seamless/repeatable pattern version? No seamless version of the design pattern is available. But maybe you can just flip one horizontally and place it like that to simulate a seamless pattern. Thanks for stopping by.